Eskimo-3 Pure Omega-3 Fish Oil with Vitamin E is a unique stable fish oil supplement containing a healthy balance of the omega-3 fatty acids, EPA and DHA. Omega-3 may help support cardiovascular health and healthy skin. Pleasant lime flavour. Pleasant lime flavour. Eskimo-3 is made from sustainable sources of oily fish living in the deep seas. Eskimo-3 contains the important omega-3 fatty acids EPA and DHA in an optimal concentration,enriched with a patented antioxidant mixture, Pufanox, which increases the oil`s stability (freshness). The oil in Eskimo-3 has been purified to reduce environmental toxins such as mercury and pesticides, PCBs and DDT, to well below the current acceptable levels. This has been confirmed in independent studies. Eskimo-3 has not been chemically modified. Eskimo-3 has no fish odour or aftertaste due to its incredible stability. Fish oils that smell and have an aftertaste have usually oxidised. Eskimo-3 fish oils really are the ideal way to support the health of your entire family. From toddlers and teens to the oldest member of the family, everyone can experience health benefits by using it as a daily supplement. 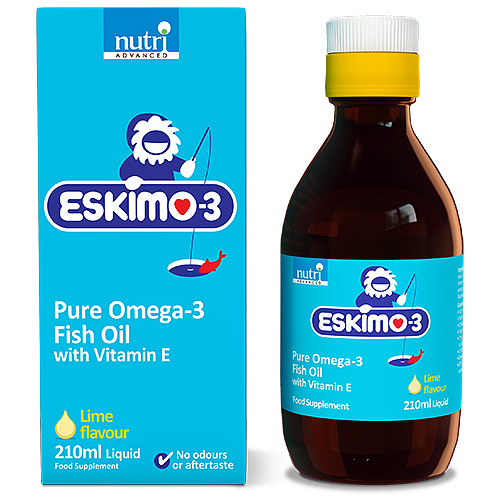 The Eskimo-3 range provides omega-3 rich fish oils which are pure, fresh, safe and effective, and are the ideal way to support the health of your whole family. Eskimo-3 was inspired by the original research into the outstanding heart health of the Eskimos who, despite consuming high amounts of fat, have exceptionally good cardiovascular health. Researchers found that this was because the fat they were consuming (from fish and seafood) was rich in the now-celebrated omega-3 fatty acids. Fish oil easily turns rancid during manufacture and storage which may reduce the effectiveness and safety of the oil. The Eskimo-3 range uses a unique patented process that ensures the oil is fresh, stable, effective and safe. Because of the unique process that ensures the freshness and safety of Eskimo-3 fish oil, it is also more effective. Research has shown that Eskimo-3 fish oil may be more effective than plain fish oil and may be a superior way to support heart, brain and joint health. Environmental toxins accumulate in fish, and unless removed will concentrate in fish oil. Eskimo-3 fish oil undergoes an extensive purification process to ensure it is toxin free, and independent studies have consistently shown that Eskimo-3 is one of the purest fish oils available. Over-fishing is becoming a serious threat to the world’s fish stocks. Eskimo-3 fish oil comes from a sustainably managed fishery, so not only is Eskimo-3 good for you; it is good for the environment and our future. Natural fish oil, antioxidant blend [Pufanox] (lecithin soy), Vitamin E (alpha tocopherol), antioxidants: tocopherol-rich extracts, extract of rosemary, ascorbyl palmitate, flavouring: lime flavouring. Do not exceed stated dose. Consult a medical doctor if on anti-coafugant medication. This is a good supplement and should not be used as a substitute for a varied diet and healthy lifestyle. Contains soy, fish (oil) and citrus. Does not contain fish protein. Once opened the product is best kept refrigerated and used within 2 months. Below are reviews of Eskimo-3 Pure Omega 3 Fish Oil with Vitamin E - Lime - 210ml by bodykind customers. If you have tried this product we'd love to hear what you think so please leave a review. Eskimo-3 Pure Omega-3 Fish Oil with Vitamin E is a unique stable fish oil supplement containing a healthy balance of the omega-3 fatty acids, EPA and DHA. Omega-3 may help support cardiovascular health and healthy skin. Pleasant lime flavour.